And so it was, the selection process had been made. I was now the proud owner of a six week old German Shorthaired Pointer. I knew what her name would be, even before I got to the kennel that day in June. 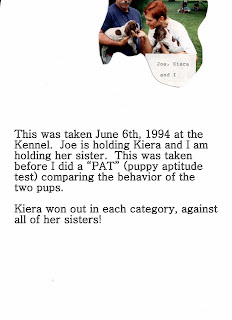 It was Kiera Von Pooh. You see, Von Pooh was the kennel name. 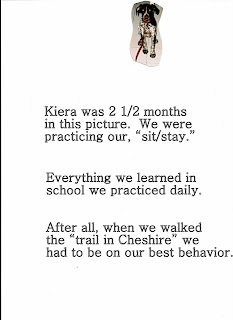 Kiera had a nice melodic ring to it and it meant "strong, brave, warrior-like." Here's a picture of her the day we picked her up at the kennel. However, her name changed when Linda, a long time close friend of mine (who has since passed away from breast cancer) came over to visit the first week I had Kiera home. As we sat on the screen porch and she watched Kiera prancing around, Linda said, "JP, she is so regal looking!" Hence, Lady Kiera Von Pooh, it was. Pointer. Can we pet her?" In dog school, we had learned to "sit/stay" your dog before someone was allowed to pet them. I instructed Kiera to do just that. The woman approached. Meanwhile, her husband was on the opposite side of the trail five-six feet away, holding the leash of their dog. The woman had crouched down to pet Kiera. It all happened so quickly. In an instant, that Weimaraner had Kiera's head in it's jaws. The woman was screaming, flailing her arms in the air. The husband stood motionless. Kiera was crying agonizingly. I grabbed the Weimaraner's upper and lower jowls and spread them open. The husband bent over, grabbed the leash and took the dog far to our right. There was a nick in Kiera's muzzle. She was traumatized. I could tell. The man and woman apologized and walked hurriedly away. They probably thought I was going to sue. Kiera and I headed home. How scary for you and Kiera! I was going to tell you about our scary experience with my Sis's Australian Shepherd, but this is such a happy topic for you I won't. It changed my attitude completely about new dogs. we had the same thing happen at the vet's, our dog Max, now deceased, was on the leash, a woman stepped out of the office with 2 huskys pulling her like she was a sled, the one female jerked away from her and jumped on Max, they were really going at it, my husband was fighting them trying to break them apart, he ended up with a nasty bite on his hand, she stood with the one dog horrified, and i yelled at her to put the dog she had in the car and come help. i was standing between the loose female and bob was keeping max off of her. i was more traumatized than the dogs and my dog bit husband. she got in her car and drove off without saying a word. the vet verifyed her dogs were up to date on their shots and offered to treat bob's hand, so i can relate to your story. well, goodness to be.. can hardly wait until tomorrow.. or could you just be kind and write part 3 now? like today? Same thing happened to my Sioux when we went to go pick up her brother at the breeders. Her father decided she was not welcome -- and you're right -- it happens so fast. Oh my gosh! I just can't imagine! I don't know if I would have been that calm and known what to do. 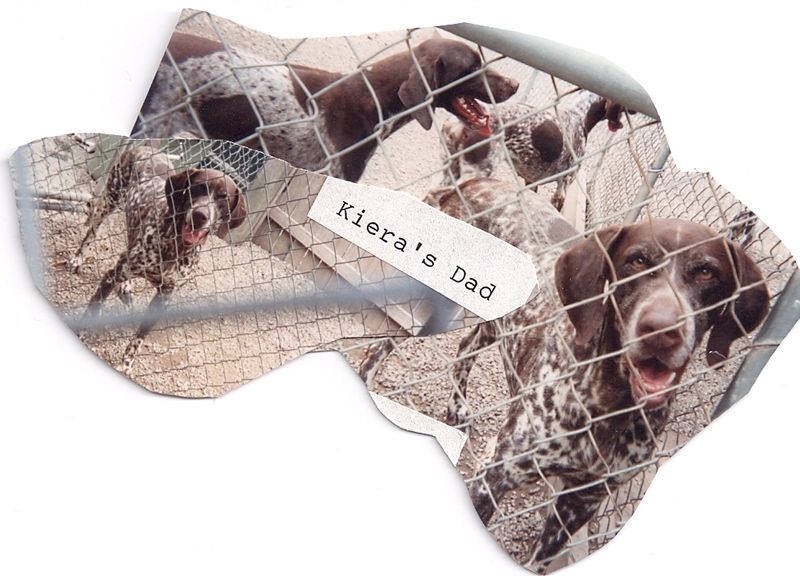 You saved Kiera's life! What a story! OH...poor Kiera!! at least HE had the sense enough to get his dog off her before the outcome went from bad to worse! Suh a terrible thing to happen! Lovely photos. You have such a special house. Have a nice week. What a beautiful dog - and what a terrifying experience. There are two rottweilers that live up the hill from us and I am always afraid of what they might do to my little cairn, Rory. Visiting from Mosaic Monday, and happy to have found your blog.